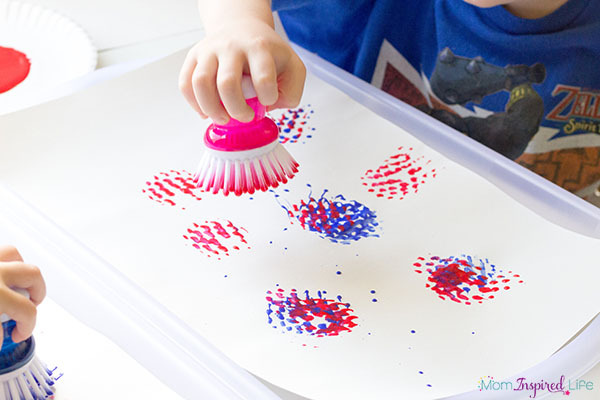 This fireworks craft is super simple. Which makes it perfect for 4th of July week! 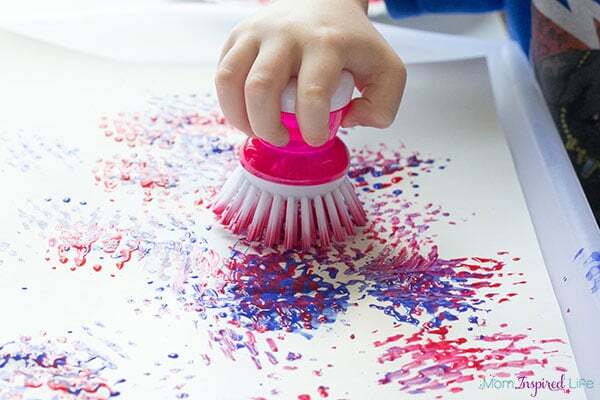 Keep the kids busy with a fireworks painting activity they’ll love! 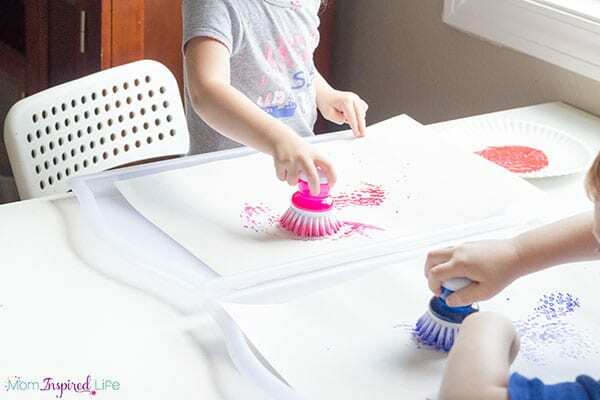 The other day I was shopping at the grocery store when I spotted these dish brushes with small knobbed handles that are just perfect for little kid hands. 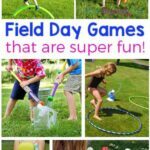 I started to think about what activity I could do with them – which happens a lot when I come across neat things in the store. As I was looking at them, it occurred to me that they look a lot like fireworks. And thus the idea to paint fireworks with dish brushes was born. 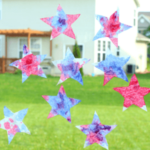 This 4th of July craft is perfect for kids (and adults) of all ages. OK, I may have joined in a bit. I think it would be the perfect addition to a 4th of July BBQ. 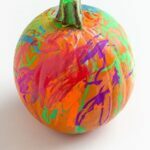 Bring the red and blue paint outside and let the kids go to town painting! This could not be more simple to set up. 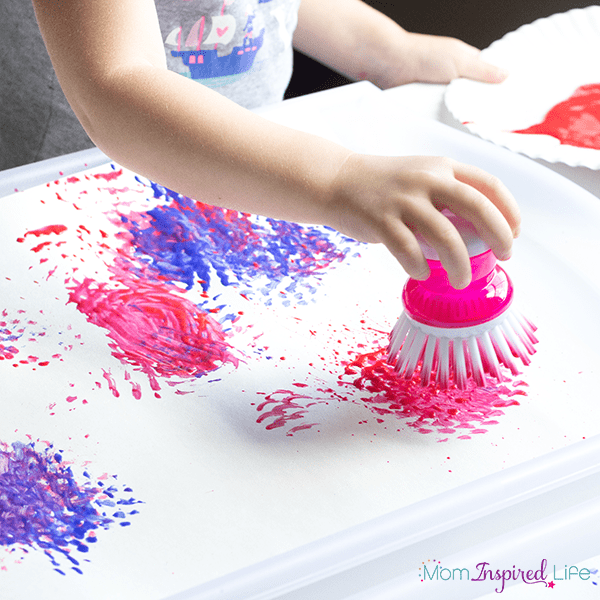 Squirt out a bunch of red paint on one paper plate and a bunch of blue paint on another paper plate. Then put a dish brush in each color and you’re good to go. 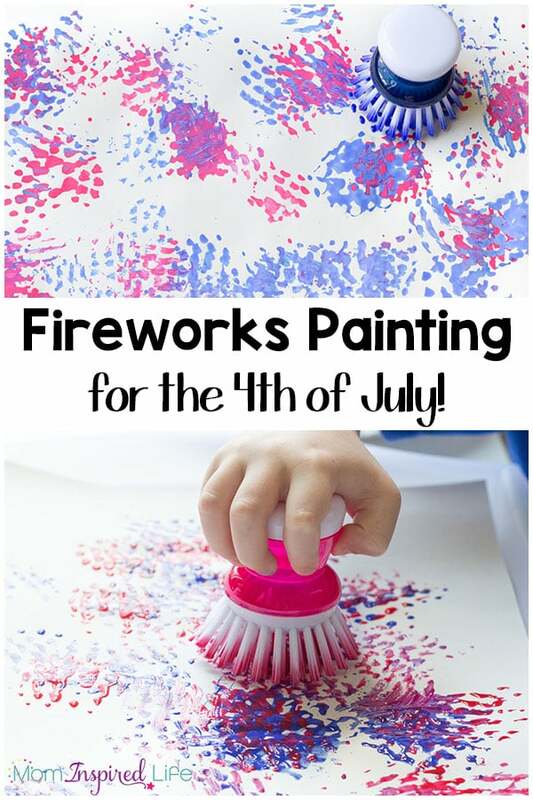 Give each of the kids a sheet of construction paper and invite them to paint fireworks! At first my kids were a bit confused about how to use the dish brushes to paint fireworks. They just started smearing the paint around with the brush. Which is an activity for another day. Wink wink. So I showed them how they could dip the brush in the paint and then press it straight down on the paper to get a neat effect that looks like 4th of July fireworks. They thought that was totally cool and began painting all kind of cool fireworks on their paper. They went through several sheets of paper before the paint started to run out and then began to lose interest. It kept them busy for a good 20 minutes or so. They loved it so much that we actually did it again another day! Who can argue when it literally takes a minute to set up?! Now we have some patriotic decor to hang on the walls. 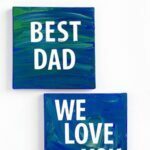 All in all, this fireworks craft was a huge win! I may even set it up at our 4th of July party! Add these American flag cookie bars to the menu for your 4th of July BBQ! 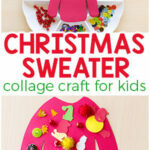 The kids can even help make them! We also had a lot of fun making these patriotic red, white and blue stars to hang on our window.